...just nine days after my other morning-newspaper-surprise (see below), I saw another photo of mine published! The caption read: "Joseph Cyr was in the right place at the right time when he captured this Guatemalan volcano and its shadow at sunset." 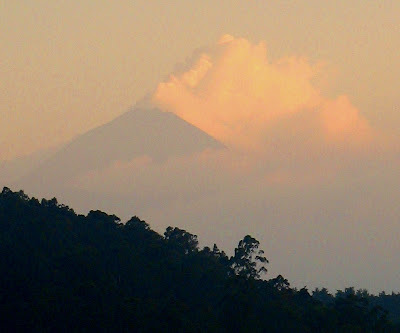 The volcano is the 12,000-ft.-high Volcán El Agua, between Amatitlán and Antigua, Guatemala. My wife and I were visiting an old family friend in Guatemala in February of 2006, (during the year that we lived in Nicaragua), and I'd just bought my first digital camera in Guatemala City. Trying to learn to use it, I walked down a street in our friend's colonia, and the humid sunset that evening ended up being stunning.